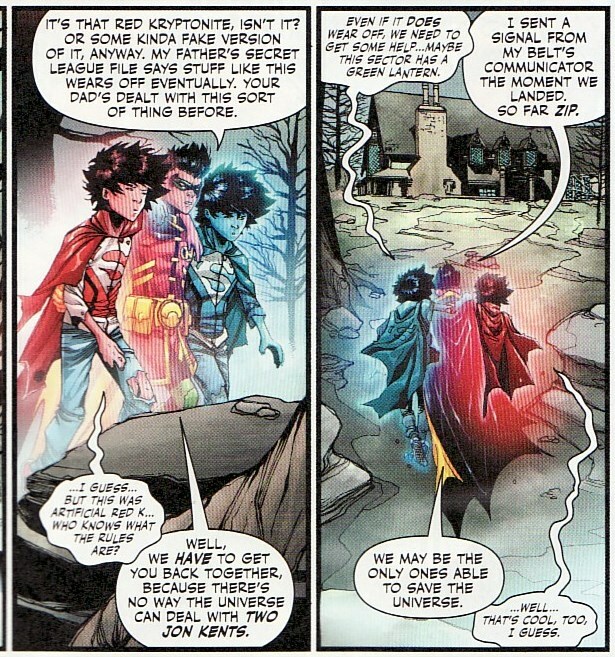 Last issue ended with the split Superboy and Robin picked up by Space Cabbie and Joker Jr. Superboy Blue and Superboy Red are feeling ill, probably from their separation. With the Gang close on their tail, it is time to beat a swift retreat. I include this panel for three reasons. 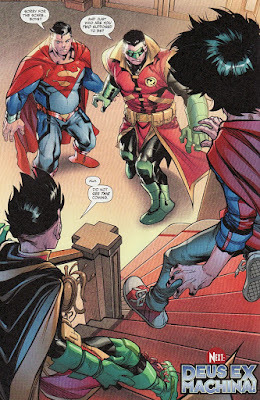 Unlike some books, Tomasi gives us a recap in one caption box, not the dreaded 'recap page of wasted space'. Thank you! Also, Robin has to be imitating Gandalf when he yells 'Fly you fool!' to Space Cabbie. Lastly, I love that Jon is puking in the cab throughout the issue. Isn't that a classic punch line, the vomit-filled taxi? Rex Luthor seems relaxed about the whole thing. He thinks the Sons are barely a threat and can't get home. 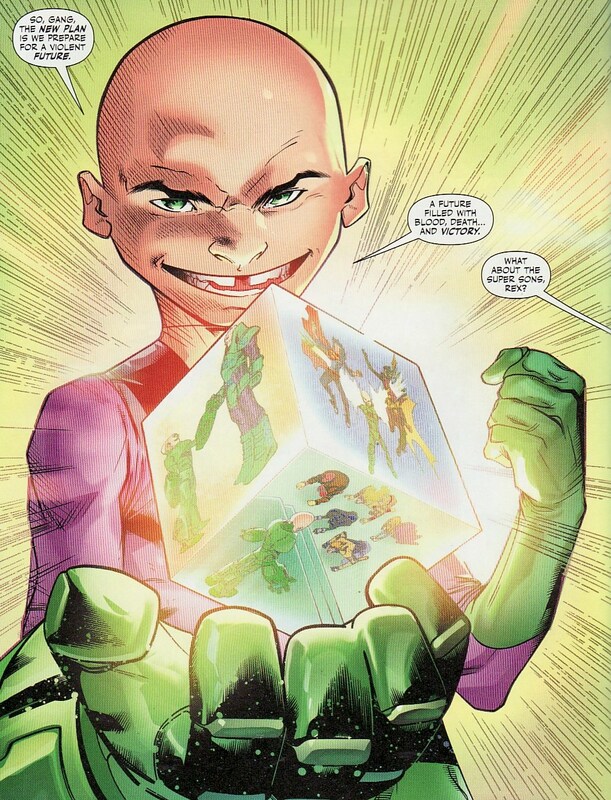 Meanwhile he has the Hypercube and will use it to head to Earth, kill the Justice League, enslave lesser heroes, and make Lex Luthor his sidekick. Whew ... talk about delusions of grandeur! But I love this page which looks so much like every image of the Red Skull holding the cosmic cube that it has to be an homage. Tremendous. And can't help but notice that Supergirl is one of the folks kneeling before him. And is that the Red Skull next to Firestorm?? In the cab, Superboy Blue is looking green around the gills. It seems he has taken on all the illness symptoms of the fission to spare Superboy Red the pain. I love Robin's response about how Superboy is inspiring himself! Remember back when I reviewed the Sons title I talked about how the differences of these characters, the friction of their approaches, is was gave this book its energy. The violent bursts of vomiting by Jon within the cab ends up throwing the taxi out of control and forcing it to crash land onto an unknown planet. Space Cabbie and Joker get to work on repairs. It seems a little too strange to Robin that the world not only has atmosphere like Earth's but also a Victorian spooky mansion in the distance. But with his friend ill, Damien decides they need to investigate. 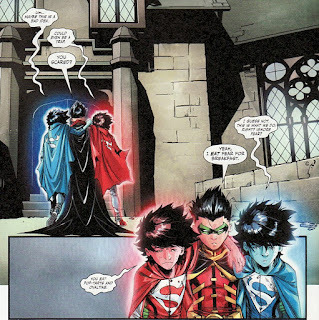 As for the split Superboys, the three hope that it is a transient process like all Red K effects. Then we get this funny moment. Damian has always been a bit full of himself and the darker of the two sons. So his saying "I eat fear for breakfast" rings true for his character. And Jon's response of the actual breakfast of Pop-Tarts and Ovaltine is hilarious. I doubt Alfred serves such processed fare but remember this is a roller coaster ride of a book, built for fun not accuracy. So the joke works. Just roll with it people! Meanwhile, the cab goes back on line. 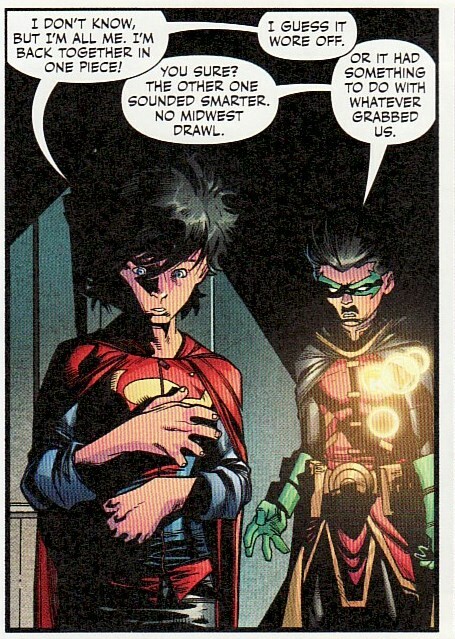 I have been feeling a bit more sympathetic for Joker Jr. recently. He talks about how Rex 'forced' the rest of the Gang to join the villainous rampage. He seems like he was caught in the undertow of Luthor's goals. But then he does something like this, tossing Space Cabbie into the trunk and taking off in the cab. He strands the sons on this unknown world. Maybe he isn't a completely nice guy. As for our protagonists, they are are dragged into the spooky house by creepy hands. Once inside, magically, the Superboys reunite. Now I suppose we could say the effect wore off. Or maybe the House's energy did it. But really, the gag had run its course. There is more DCU wackiness to explore. So roll with it! And then inside we learn this is the House Of Secret Mysteries, the Doorway to the Unknown. So it is a mash-up of all the horror analogies. All we need is to hear how it is also the House of Unexpected Nightmares and we'll have Bingo! Time to crank up the characterization. Damien says he is ready to beat up monsters and poets is perfect. 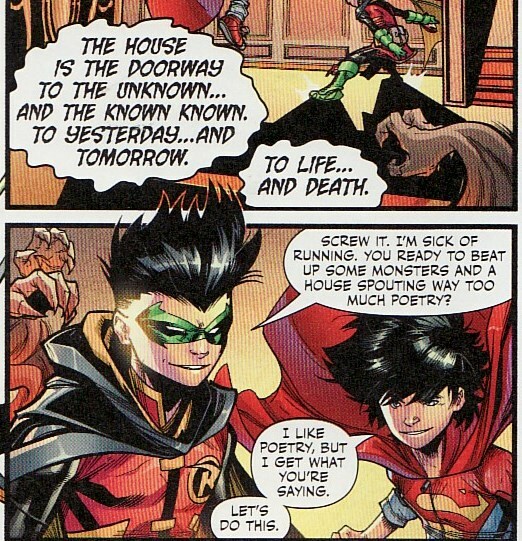 Jon saying he likes poetry but will join in is perfect. This book was sort of perfect. But we have to end with a cliffhanger. So what could be better than running into adult versions of yourself? Or, as I am guessing, what could be better than running into your actual selves who have been wandering in this timeless house for decades? I don't think these are different versions of the sons. I think it is the sons themselves! Anyways, I have enjoyed this comic for the entertaining silliness that it is. 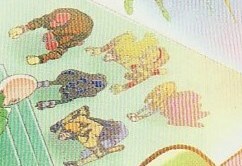 I am going to drink in the next 8 issues. Kudos to Tomasi and Barberi for bringing a smile to this grizzled comic reader! This was such a fun issue, I smiled at every panel. So they bumped into Lobo and a Green Lantern (I don't know which one, am not well-read into the GLs) while careening out of control? Just plain delightful silliness. I love the Three Stooges moment when Damian (as Moe) bangs Jon-Red's head into Jon-Blue's. 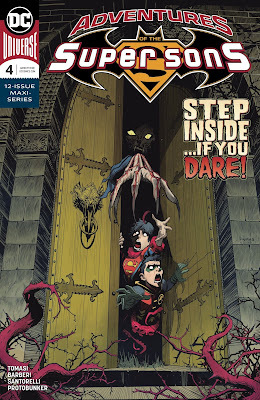 Another very funny issue, full of humor and homages. And the last page is glorious. I hadn't spotted that Supergirl sighting. Good eye! How very DARE Rex Luthor imagine Supergirl as a lesser hero! That’s not the Red Skull, it’s boring old Red Hood.